It all began with a language school in Addis Ababa, Ethiopia, a Norwegian girl and a block of brown cheese. Our bride, Melody (a beautiful girl from rural Northeast Pennsylvania), was studying Amharic at a language school in the same town where our groom, Dereje (a handsome film student from the capital of Ethiopia), was living. They had a mutual friend, Heidi (an amazing girl from Norway), who was in Addis Ababa working for a non profit organization. Although Melody and Dereje had bumped into each other several times at the school compound, their true connection came when Heidi entrusted Melody with a block of brown cheese for Dereje before she left for Norway. Dereje (hereafter referred to as 'Glad' - his childhood nickname), eager for his cheese, made an appointment to meet Melody for the drop off. Unfortunately, Melody forgot the cheese. This happened several times: Glad scheduling lunch dates to get the cheese, Melody showing up empty handed. Over time, the two became friends and began talking about their work, their lives and their dreams. Their friendship grew into romance which blossomed into a proposal of marriage. Then the separation began. Melody moved back to Northeast Pennsylvania to begin preparing for the wedding and advocating for Glad's visa. After months of being apart, paperwork, lawyers, bureaucrats, and wedding date changes, Glad was granted a visa and the final wedding date was set! You could not find a happier couple. The plan was to have the wedding in Melody's family barn. It was a fantastic space and I could not wait to get my hands on it! Unfortunately, it needed a very good cleaning, lighting installed and tons of work to make it into the dream space we were hoping for. This is a picture of the barn semi clean and semi lit. The task was daunting, but Melody and Glad and Melody's father were tireless in their efforts to make it happen (Melody's mother supplied hot meals, good tea and lots of emotional support. Afterall, someone has to be behind the scenes to hold it all togehter). My team and I also spent many, many hours in this barn in the cold of November and December, but it was a labor of love. And this is what we did to it. Because it was December and the potential for cold was real, we decided to have the wedding ceremony inside the barn at one end of the barn. 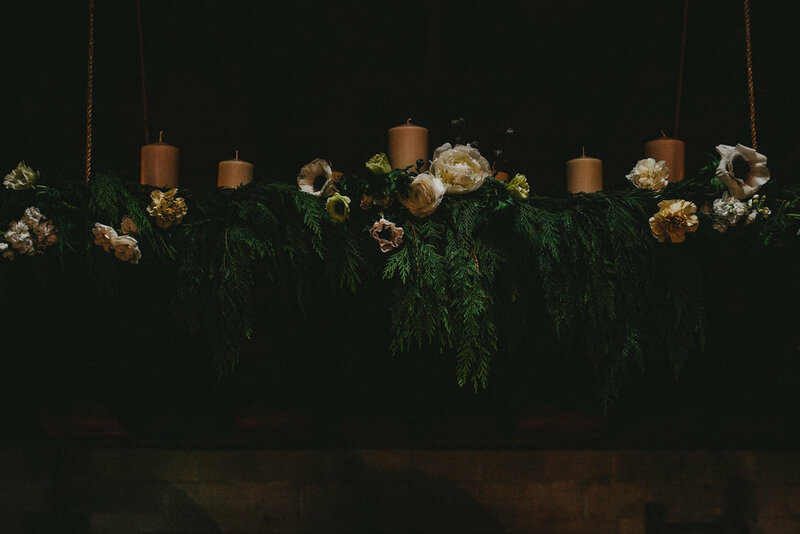 It was filled with candles, vintage chairs and sofas, a beautiful chandelier and flowers. Simple and beautiful. Instead of a wedding arbor, I decided to make this gorgeous old barn door a focal point by adding flowers and greens. The parents' property was an old Christmas tree farm, so I had lots of choices for evergreen foraging. I love the whites and soft pinks. Melody's winter bridal bouquet was white with just the palest of pinks. Melody's floral crown was wax flower and lisianthus buds: simple and perfect for her dark hair. Even though they had worked so hard to hang hundreds of grapevine branches, Melody and Glad were not allowed to see the final product until this moment. And this moment makes all the planning and work and angst worthwhile. I love revealing a space to my couples: all the magic and all the feels. This is one of the most romantic weddings I have ever designed. Twinkle lights, hanging Edison bulbs and floating candles made this space the dreamiest I have ever seen. This is why I am an event stylist. Small details make all the difference. I just love this bride and groom. The dance and bar space for the wedding reception were heavily draped with cedar and spruce branches. We also carried out our theme of light throughout the entire barn. Without a doubt, the most international wedding party I have had the privilege to work with - and one of the sweetest. I believe there are five nationalities represented here. Over the wedding dessert table, we suspended a vintage shutter decorated with greens, flowers and candles. Crossing oceans and countries and cultures, we have our Happily Ever After for Melody and Glad. Perhaps love...and cheese...really do conquer all. ps Glad never got the cheese, but he did get the girl.